Playlists have become a vital part of every release campaign – for developing and established artists alike. That’s why we wanted to build the most powerful mobile tool to keep you informed about your musics’ playlist-performance. Ready for an inside scoop? Here’s what you get from the ForTunes playlist tools. In the ForTunes FEED we instantly update you when one of your tracks gets added to a Spotify playlist. If you tab the feed event, we present to you additional information: Playlist followers, playlist owner as well as the position of your track within the playlist. 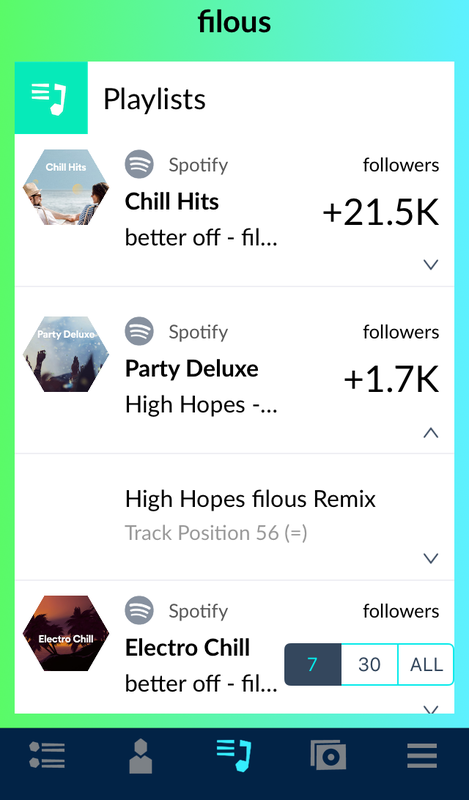 From here you can jump directly to the playlist and the owner in the web or to more detailed screens – Track Playlists and Playlist Details. But let’s start with our Playlist screen: Tap the playlist icon in the tab bar. On the PLAYLISTS screen you can see all playlists which currently contain one or more of your tracks. The playlists are automatically sorted by followers. Switch between time modes (7/30/ALL) to see how the playlists are developing and get a quick overview about how your music is doing. Tap a playlist entry to learn where your track is positioned within the playlist. If you’re on 7 or 30 days mode you can see how the tracks’ position has been developing. Getting deep data is the key to a better understanding of how and why your music performs within the streaming sphere. So far, so good. From the Playlist Screen you are able to jump to TRACK PLAYLISTS. Want to know how your latest single or one of your catalogue tracks is doing? This is the place to go. On the Track Playlists screen we show you all playlists (again, sorted by followers) of one particular track. 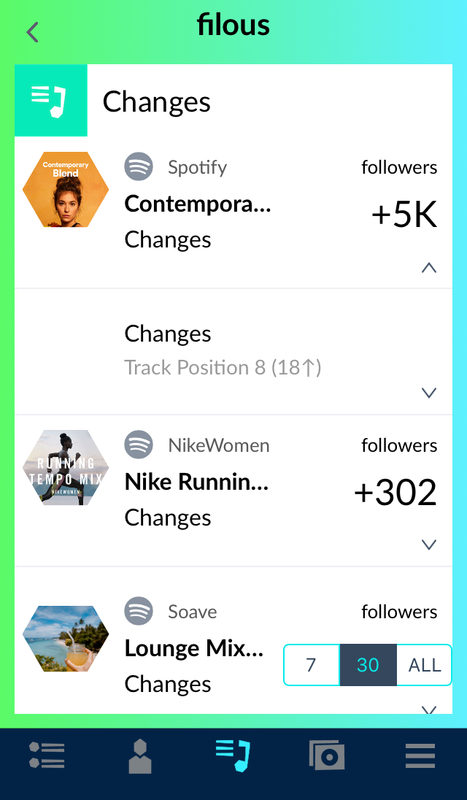 The screen offers the same functionality as the Playlists screen – so you are able to switch between 7/30 or ALL mode and get the tracks’ position over time. Want to learn more about one particular playlist? Jump to the PLAYLIST DETAILS screen and dig into it. 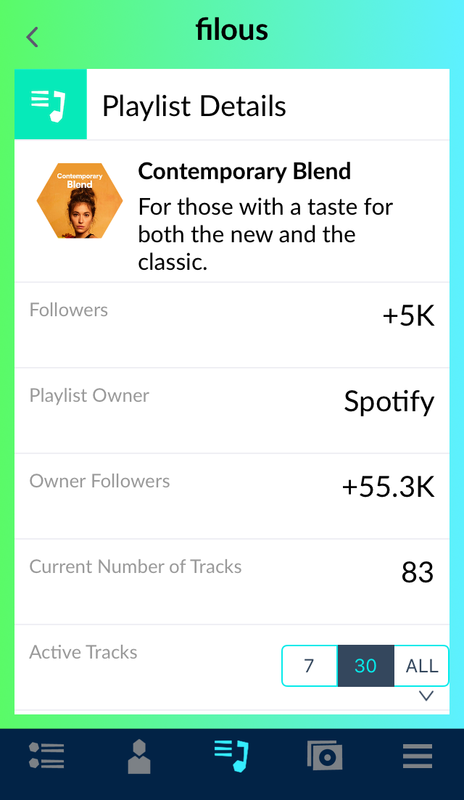 Here we show you information about the Playlist (including the description, Followers, Playlist Owner and more) and your tracks. “Active” means these tracks are on the playlist right now. “Removed” means the track has been on the playlist in the past (but isn’t anymore). Ok, is your head buzzing yet? Don’t worry. ForTunes is an intuitive tool, once you get the hang of things. And that will happen fast. Promise. Before you approach Playlist Owners with your next release, dig deep into the ForTunes playlists tools and find the right playlists for your music. Tip: Track similar artists to find out which playlists work for them. Although we’re tracking a lot of playlists, sometimes we miss one. Get in touch and we’ll make sure to add them right away. And obviously, if you have any question – go ahead and hit us up. Get the latest update on the iOS store or log into your account! Next ArticleZYYN "You can literally grow your brand solely off of Instagram"